You can still watch the first official trailer for Extremely Wicked, Shockingly Evil and Vile here for more. 1969. Ted (Zac Efron) is crazy-handsome, smart, charismatic, affectionate. And cautious single mother Liz Kloepfer (Lily Collins) ultimately cannot resist his charms. For her, Ted is a match made in heaven, and she soon falls head over heels in love with the dashing young man. A picture of domestic bliss, the happy couple seems to have it all figured out … until, out of nowhere, their perfect life is shattered. Ted is arrested and charged with a series of increasingly grisly murders. Concern soon turns to paranoia—and, as evidence piles up, Liz is forced to consider that the man with whom she shares her life could actually be a psychopath. 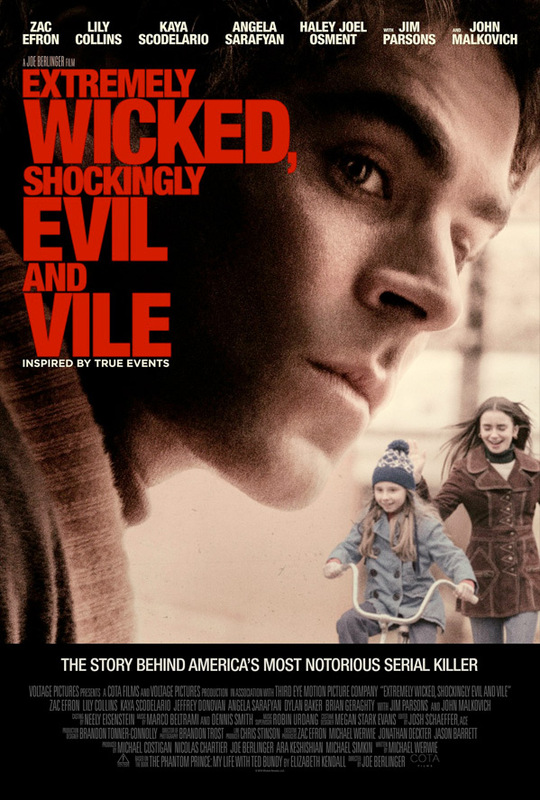 Extremely Wicked, Shockingly Evil and Vile is directed by American producer / filmmaker Joe Berlinger, director of the film Book of Shadows: Blair Witch 2, as well as many TV projects and lots of docs previously. The screenplay is by Michael Werwie. This first premiered at the Sundance Film Festival earlier this year. Netflix will release Berlinger's Extremely Wicked in select theaters + streaming May 3rd.